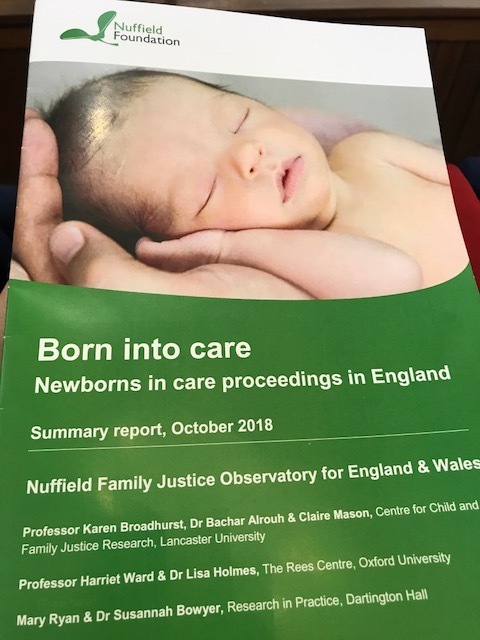 On 9th October 2018 I attended the launch of the Summary Report of ‘Born into care: Newborns in care proceedings in England’ from the Nuffield Family Justice Observatory for England and Wales. The Nuffield Family Justice Observatory aims to support the best possible decisions for children by improving the use of data and research evidence in the family justice system. The main report will be online as of 10th October; this post deals with a summary and overview of its main findings. The focus of the report is new borns subject to care proceedings, ‘new born’ being defined as an infant less than 7 days old. ‘An infant’ is a child less than 12 months old. The study used CAFCASS data from 2007 to 2017 to provide the first estimate of what proportion of care proceedings for infants are issued for newborns. In the decade covered by the study, 173,002 children were involved in care proceedings and 47,172 (27%) were infants. At the outset, 32% of care proceedings were for newborns – by the end that had increased to 42%. Newborn cases also increased in volume over time; at the outset 1,039 cases were issued involving newborns; at the end 2,447. Thus the likelihood of newborns in the general population become subject to care proceedings has more than doubled. An alarming finding was the marked difference between the regions. The North West had the highest rates at 30 newborn cases per 10,000 live births in general population. Contrast this to London which had only 18 newborn cases per 10,000 live births. A minority of LAs departed significantly from the expected average – the range for such outliers in 2016 was between 55 and 159 newborns per 10,000 live births. This is clearly troubling, and we need to investigate more closely the reasons behind such regional disparity. The report suggests that differences are most likely attributable ‘to an interaction between professional practice and socio-demographic factors’. Of particular interest to me was the suggestion that we should investigate the influence of the local Designated Family Judges. As it is a matter of some annoyance to me that different courts are developing divergent ‘local practice’ with regard to primarily administrative matters, it is not a great leap to think that a particular culture or approach may start to take root under the leadership of a particular Judge. This refers to newborns who had already had an older sibling appearing in care proceedings. In 2012/3 and 2016/7 this represented 47% of newborns. Without the experiences of an older sibling to inform the court, this raises issues about how the claim of ‘significant harm’ is going to be proved to the court – pregnancy provides only a very short window for an assessment of parenting capacity and support for change. In 2012/13 only 28% of care proceedings completed within 26 weeks – in 2016/7 this increased to 61%. More research is needed to understand what is happening and what is different about the 39% of cases that do not complete within 26 weeks. The total percentage of newborns subject to final care and placement orders was 47%. 21% were placed with extended family. 13% were placed with family. This requires further investigation – we need to know more about the circumstances behind those percentages. Is increasing financial hardship for families a factor in the rising rates of newborns in care proceedings? What is the impact of the reduction in preventative services on rates of newborns coming before the courts? Does a defensive risk averse culture mean that professionals are less likely to want to work with the family without the security of a court order? What accounts for fluctuations in the volume of newborn cases over time and place? Loss of empathy in the system. What’s going wrong when people in the system want to do their best. ‘The arms that we used to put around families – which are no longer there’. Development of ‘best practice’ in the maternity setting – how to make the whole experience of removal less brutal for mothers (and fathers). A lot of this would be fairly simple to adopt and wouldn’t cost a huge amount – so why aren’t we doing it? A need for better knowledge about what is done elsewhere – how do jurisdictions beyond England protect newborns, whilst also ensuring the rights of parents and wider family. We have the numbers – now we need to drill down and look at reasons WHY such care proceedings are initiated. And what happens AFTER proceedings? Are there groups of children who should be followed up? This entry was posted in Uncategorized and tagged Family Justice Observatory, newborns in care proceedings on October 9, 2018 by Sarah Phillimore. That’s a great summary, thank you and my comments are based on your summary only as I haven’t read the report in full. I work in criminal and social justice and supporting families that have cross overs between both arenas. I have found the report alarming but not surprising in that I was well aware that removal at birth was higher in the NW than London. Bearing in mind, the NW is like London, a huge area. I’m a qualitative researcher and therefore much more aligned to smaller studies in defined geographical areas. In relation to what I know, based on my experience with a cohort of mothers that a) have experienced care themselves as children and b) have been involved with the criminal justice system, I am pleased this on the radar and I’m a huge reader of Professor Broadbent. There are Socio-economic factors at play in the very generic split between London and the NW. People in the North in comparison to their London counterparts, have overall poorer health outcomes, experience social and financial exclusions. In the NW, there is not a shortage of housing (and housing is a huge factor in this area) but there is a lack of jobs. In London, there is not a shortage of jobs, but affordable housing is hard to find. In our area, we are experiencing third generational problems. Deindustrialisation in the early 80s caused a loss of over 60,000 jobs overnight. What occurred as a result of this was the industry that served our working class areas provided for families. Those people that lost their jobs had children (I was in my early teens) that then had fewer aspirational tendencies. Those children then had their children, and became reliant on the welfare system. This is relevant in the much bandied rumour that having a baby at 16 guaranteed council housing which was more available then. As those children (today’s parents) dependancy on the welfare system grew, so did their problems. Drugs, alcohol and criminality increased and as a result of the social issues, a growth in services began to appear. Therefore, this growth of services became a new industry and social issues and problems within communities began to develop. Services were created not to meet needs, but to create needs. What happened was that people became dependent on these services because a need had to be created to meet the need of the service providers. As deprivation of our area grew, so did the social issues. Substance and alcohol use became prevalent and children at risk increased. Domestic abuse became widespread and growing bodies of research began to highlight DA. The introduction of The Troubled Families programme, drug treatment services popped up as major providers of health care and the introduction of benefit caps all had a major influence on families struggling to hold it all together. Cuts to local services and amenities were present and social work as a vocation grew. Problems in families became more apparent as the growth of social media presented itself. Shortage of money became ‘poverty’ and homes became at risk. What needs to be done is an ambiguous question. Services rely on funding that is often only a short period of time so staff retention is poor. Reliance on the voluntary sector is becoming more apparent. In two cases alone, it has taken five years of support for two mothers that have had home placements following removal at birth. The cost of the ongoing legal proceedings working towards discharge of care orders is alone, costly. What can be done? Support mothers from birth, where necessary in smaller units if they can’t be in their homes. And examine thoroughly longer-term dynamic and static needs. Static needs must be overall health and wellbeing of the child. Dynamic needs will be that of the mother. Stable housing, access to income (however that is made up) access to primary healthcare services for both mother and child. Primary carers needs change over time. I’d be looking for habilitative solutions and addressing issues earlier in peri-natal stages with specialist midwives. I don’t see that a raft of agencies involved serves the mother or the child well. If a primary carer has their needs met, then it is likely that they will be in a stronger position to meet the needs of their child and thus lessen that child being at risk of future harm. Thanks Tracey, that is a very interesting and informative comment. I have advised Louise Tickle to read it as she is considering an article on the issue of the ‘outliers’ and what reasons could explain particularly high or low numbers of newborns being subjected to care proceedings. I hope she contacts you for further discussion – I think this is a very important issue. We need to understand why the differences are so marked between the different regions. Thanks Sarah and I know Louise Tickle. Of course that’s my opinion based on experience and knowledge and from the findings in my forthcoming research that covers women exiting custody and the barriers they face in accessing housing. Just a typo there, Professor Broadhurst – predictive text. It’s an interesting discussion and needs to gather legs to further action in the N/S divide. It’s a gaping chasm that does need examining. Louise Tickle, when writing her articles,should bear in mind history and the persecution of certain classes of people to the advantage of the authorities. It goes back to the days of the ancient Egyptians at least. How is deliberate persecution of the vulnerable effected today and where is it in evidence? Why one post-code area and not another? Answer: Because the folk in those regions are deprived not only of economic opportunities but also of their fundamental civil rights. It has always been beneficial to the authorities politically to split the masses they govern and to develop an underclass.It is then easy to persecute them for the benefit of those in power lording it over them because of the false ideology that ,by their dysfunction and misfortune,they deserve every stone thrown at them. What are the mechanics of such corrupt systems? 1. Deprive the ‘underclass’ of access to the protection of the law as granted to the rest of society.I.E. deliberately foster and allow a level of criminal activity to flourish.For example,the Police will not even take action against clear cases of domestic violence or illegal drug peddling.It is deliberate policy; they have no-go areas ( specified behind closed doors only to the high-ups).Sometimes they don’t even respond to calls for help. By such a policy,the vulnerable naturally become morally depraved and the Authorities can justify going in as they choose and persecute them as and when they choose.Especially in one of our inferior family courts it is easy to present false evidence and predicate on the family ‘dysfunction’. I am afraid to say that also dishonest Police ,dishonest public officials and other predatory criminals are helped in that they can commit crimes themselves ; then they can easily call in and blame one of the vulnerable people they have prepared to be put ‘into the frame’. For example, the Police will ignore small-time criminal activity for a while and refrain from prosecuting a thief.Then when one of their ‘chums’ are caught out,they will arrest and charge those they have previously set up.It isn’t hard to persuade a small time offender to ‘confess’ to crimes they haven’t committed ( tic’s) if the officer promises to arrange for a light sentence. If you read this,Louise Tickle, I want you to understand that the authorities not only target the vulnerable for persecution but they deliberately create the disadvantage and vulnerability. Next time you are considering a case,bear this in mind.Ask specific questions such as ‘why no Police investigation’?.’Why no response to a call for help? Indeed, consider facts more realistically.When an LA ignores a referral and a family’s pleas for help and support it probably has nothing to do with any lack of resources. It is all to do with deliberately preparing them for the frame and ‘fattening’ the children for exploitation. Hope this helps.We all have to wisen up and ask pertinent questions such as I have suggested above. This increase in children removed at birth is a big injustice and we can,of course, draw parallels with the inhumanity imposed on illegitimate children and single mums in the past which continued until the early seventies before action was taken and less inhuman practices instigated.Children were exploited and trafficked and lots of money was made then by carers and adoption agencies until it was stopped. In my opinion, the problem is not the increase in single mums and the problems caused by that, not the lack of mother and baby care-units, not the lack of training or the ability of SW’s and midwives and certainly not the lack of money available to society in order to choose more humane solutions. The problem lies in the deliberate persecution and exploitation of these vulnerable mums and babies by the Authorities. In time, they will, we trust, be reined in again as were the culprits 40 years ago but the problem with institutional abuse is that it will always re-emerge in time. In another 40 years it will come around again. Authorities will always find ways to abuse and exploit citizens, it is a problem which is inherent in all public systems and especially bureaucratic ones. The only protection citizens have against institutional inhumanity of this kind lies in the LAW which should be enforced. We should never cover-up for unlawfulness.The removal of babies from their Mums at birth or any other time is always avoidable. THEY CAN ALWAYS BE KEPT TOGETHER even if they have to be institutionalised TOGETHER ,fostered together or whatever. Nothing is more inhumane than dragging a baby from the breast of it’s Mum at birth. So i repeat, the problem which needs to be recognised as such and banned is the deliberate persecution and exploitation of the vulnerable for profit not anything else. I look forward to further comments. I hope these are constructive questions not negative ones. 1. Here at the CPR, we all appeared at one mind that the system was ‘unfit for purpose’ quite some time ago. Does the increase in babies entering the care system at birth suggest progress in that respect ? 2. We appear to agree that when families are permanently liquidated that the system has ‘failed’. Does the increase in removals at birth suggest an improvement in the rate of failure or the opposite? 3. We all recognise ,as do many lawyers, that the judicial system is broken and hanging on by a thread. We recognise the great power imbalance, we understand the tragic effect when excessive power is granted to Public Authorities and some individuals engaged in child-protection we realise the dearth of courts , court time and legal funding for the families can lead to poor representation for the vulnerable. Has the subversion of the judicial system contributed to the increase in babies being removed at birth? Or would a less effective justice system and less efficient representation be more likely to cause a decrease? 4. I don’t know whether figures are published or not but does anyone know if the increase has coincided with an increase in growth in the private care industry alongside with increased dividends for shareholders. Or have profits plummeted in proportion to the increase in newborns taken ? 5. What percentage of babies taken are actually adopted? It is imperative that due procedures are followed especially in regard to the recording of adoptions and deaths in care. Are regular checks on outcomes conducted independently? These are important questions which arise from the post above . I realise they may be awkward for some professionals to consider even and that others will prefer to turn a blind eye to them but i I look forward to any replies from any source. Well according to the Children’s Commissioner not enough babies are born into Care . This is very odd all round. There is clearly no money for either offering support OR taking more children into care. The Judiciary have been very clear that the family justice system cannot cope with the rise in applications. So just what is going on? A very good question ,Sarah. I suggest that the private care industry ,as always, has been keeping itself busy lobbying its political friends in support of its own continuous quest for growth and its need to make more money and increase shareholder interest EVERY YEAR. Hence the calls for more and more to be added to the social care pot. Likewise ,there have been calls for more funds to go into the prison system. I fear an improved ,well-financed judiciary is felt to oppose these political imperatives so we should not expect any action in that quarter aimed at correcting the power imbalance we see as a massive problem. I am sorry to hear this Stephen – but I assume you have had legal advice and a lawyer? What do they say about it?